Who says going to school on the weekend isn't fun? 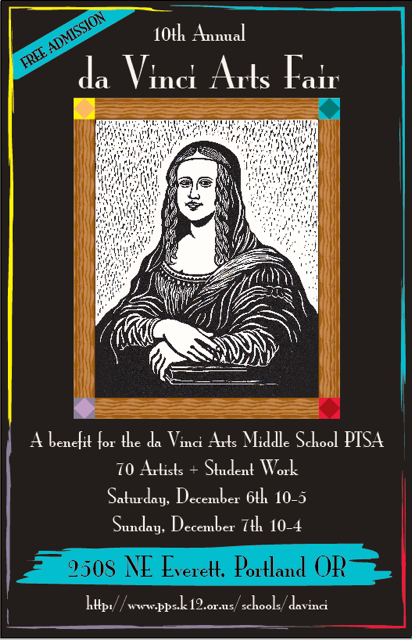 On December 6th and 7th, da Vinci Arts Middle School will open its doors for the 10th annual da Vinci Arts Fair, featuring boutique arts and crafts by more than 70 juried local artists. Hours are 10 am to 5 pm Saturday, and 10 am to 4 pm on Sunday. The event takes place at da Vinci Arts Middle School, 2508 NE Everett St.
One of the more popular holiday fairs in Portland, the da Vinci Arts Fair offers the ideal shopping venue for handcrafted gifts made from all sorts of art forms. Patrons can shop from an intriguing array of more than 70 juried artists showcasing ceramics, clocks, clothing, sculptures, paintings, pottery, photos, soaps and wearable art. There is also live music, hands-on art activities, a cafe, and a selection of student artwork for sale. da Vinci Arts Middle School is a special focus school in the Portland Public School system. Founded in 1996 on the belief that the arts are essential to human development, da Vinci Arts Middle School seeks to serve a culturally, ethnically and economically diverse group of arts-focused learners in grades 6 through 8. Its goal is to create a rich arts-filled learning environment for students, staff and families. For more information, visit www.pps.k12.or.us/schools/davinci.